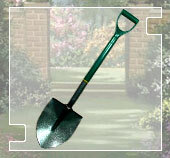 A garden spade is a garden tool that is primarily used for digging, planting, and cultivating. This sturdy tool has a thick handle and a heavy, flat, and square point blade that can be pressed into the ground with the foot. Few garden spades have a rolled shoulder on the top of the blade, which makes it easier for the user to apply foot pressure in unusually hard or heavy soil. The type of spade to be selected entirely depends upon the area of land where you want to use it. For instance, for a ground with too many rocks and stones present underneath, a long narrow spade is ideal; while for a garden bed having comparatively less stones, a wide and short spade is perfect. An ideal garden spade should possess a forged blade, which should be fixed with the handle at a slight angle, rather than at ninety degrees. Also, its handle should provide perfect and convenient grip, even when used for long hours. Spades made of galvanized steel are preferable, if they are to be used in moist conditions. Transplanting spades are considered good, especially for working in gardens where the plants are grown at short gaps. This is so because working with a transplanting spade in such gardens minimizes the accidental harm to the nearby plants.